Tell me if this sounds familiar, George Mason losses at home and the opposing team has a player record a career-high? The Patriots suffered their first ever loss to Towson since they joined the CAA in 2001 and snapped their 20-game overall win streak over them. Mason hasn't been this bad at home since the '06-'07 season. To put things in perspective their home record between the 2007-2008 and the 2011-2012 seasons was 67-7; their home record his year is 7-6. Also, their home record for CAA games this year is 4-5. The last time George Mason lost that many conference games at home was during Jim Larranaga's first year as head coach in 1997-1998 season. Jerrelle Benimon destroyed the Patriots and got 22 of his career-high 31 points in the first half. Mason held him scoreless for a long period in the second and half and mounted their comeback, very similar to last Saturday's game against William & Mary. But this time they fell short in overtime. Erik Copes had a career night as well but Mason really could have used more of Sherrod Wright, especially late in the game. Copes' hard work was a big factor all night and he added 13 points to go along with his 15 rebounds. He and Jonathan Arledge gave the Patriots a good attack in the front court but it wasn't enough to make up for their poor efforts on defense. Benimon got way too much freedom in the first half and Towson was in control almost the entire game. Mason got outrebounded, especially in overtime and that was all she wrote. It was more of the same on defense for Mason last night. Wide open looks on the perimeter were plentiful for the Tigers and Mason would have been blown out if Towson didn't go a bit cold in the second half. Fouls came back to haunt them and the overall lack of discipline was again evident. Sherrod Wright disappearing again certainly didn't help. Overall Mason's offense has improved lately and they don't need to lean on Wright as much but their defense continues to be the team's achilles heel. Hewitt has to go. We haven’t lost to Towson at home in 36 years. Not to mention the loss was embarrassing but all the open seats were almost just as embarrassing. It's a sad thing, really, because I see the guys out there trying hard. And Copes' earlier comments comparing us to the UConn program, as far-fetched as it sounds to me, at least shows he believes in the team. And we have definitely seen some players improving down the stretch -- hard work paying off. But the team is simply undisciplined, especially on defense. Now some may say that they do see some evidence of coaching, and I would agree, but a lot of it seems just to be shuffling personnel (such as last night when we put Okoloji and Bennett on Benimon). And one other thing about shuffling personnel... does it seem like Hewitt pulls players out according to a pre-planned schedule? Sometimes I see players getting yanked just as they are heating up. And one final thing for those who were able to watch last night's game: I did NOT know that they allowed pushing in overtime. Hmm, interesting rule. I don't think coaching is the problem. Talent is. If I thought Mason was the more talented team on the floor night in and night out, and they lost, I would say Hewitt is the problem, but that is simply not the case. There have been some major dissappointments in perceived talent level, Williams, Vaughns, Gray, Okoloji. Copes is improving, as is Arledge, but Wright, who at one point was a candidate for POY, will be lucky to make 2nd team. All high mid major recruits. A coaches job is to devope players. It is his 2nd year with these guys and they are under performing. No one to blame but the coach. Does this team have enough talent? Nearly all the scholarship players on the roster seem to have the talent necessary to play at this level. Certainly, there are no super stars and, frankly, I thought the Towson squad was more talented overall. But this is a better squad than several that Coach L had. I see at least two problems, however. The pieces don't fit together very well. After a whole season, I don't see how Mason can field an effective backcourt with these players. The leadership, quickness and ball handling are just not there. Second, players are not showing the kind of improvement that's needed. The CAA is full of talented players. The teams that win have players who have refined their games -- discarded the stuff that doesn't work and perfected the stuff that does. Here I see Jai Lewis as the perfect example -- a player who limited himself to his most effective moves. By his senior year, he had only a few moves, but they were all winners. And here you have to fault the coaching. You just can't put any five players out there, no matter how talented, and expect them to win. I agree 100%.When its late in the season and you see guys still being left wide open then the coach does not have them in the right position. Also, Rick Jank's comment about shuffling players on a schedule seems to be spot on. There have been too many times where the guy heating up is suddenly on the bench. I think we are in for a bad stretch in the coming seasons. Most of us were cautiously optimistic about Hewitt when he came on board two years ago. He had success at the Mid major level before GT, but GT also paid him a lot of money to leave. But it appears that the GT fan warnings about him were right on the money and I don't see how GMU is going to get out of his contract early. Furthermore, I am not sure we should hope for his speedy departure because I would not want to see this team saddled with another TOC coach. 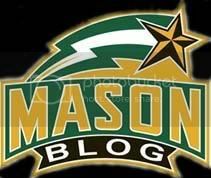 Where does George Mason go from here?